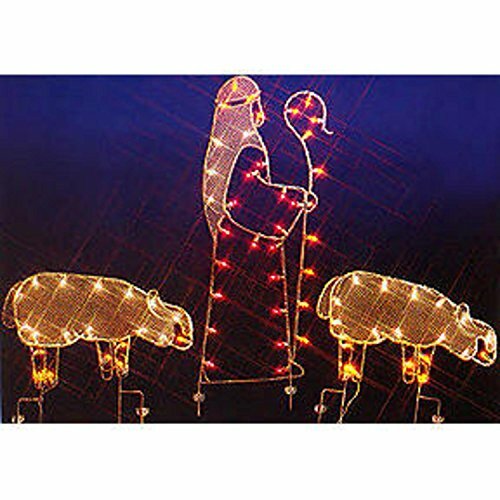 68'' Nativity Shepherd and Sheep Silhouette Lighted Wire Frame Christmas Yard Art by Vickerman at Animal Backgrounds. MPN: 31082771. Hurry! Limited time offer. Offer valid only while supplies last. Illuminated with multi-color C7 lights. Easy assembly required. UL listed for indoor/outdoor use. Lawn stakes included Dimensions: 68''H x 60''W. Northlight Seasonal Pre-Lit Rustic Burlap Feeding Reindeer Christmas Yard Art Decoration, 44"
Northlight Seasonal Pre-Lit Rustic Burlap Standing Reindeer Christmas Yard Art Decoration, 60"